New week, new month, and a new start back at school when the children returned after half term. I was talking to my husband about how recently it’s been a perfect storm for me of infrequent events all colliding at the same time. 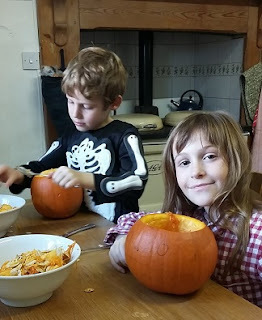 Take two writing deadlines and the last careers workshop I’m responsible for organising, mix in half term, day trips and a family visit, then kerpow hit the entire family with a vomiting bug (nice) and even when school restarts, pile on a school trip and Hallowe’en. So here’s for a more peaceful but still thrifty November! And here’s my round up of our five fabulously frugal things this week, with a distinctly spooky theme due to Hallowe’en. My children go crazy for Hallowe’en. They like the dressing up, the decorations and going out after dark, but what they really love is returning with their bodyweight in Haribo. I’m definitely up for the community feel of Hallowe’en, meeting neighbours that take part and saying hi to other families, but I’m not up for an expensive evening, or buying loads of plastic tat that will only end up in landfill. Part of the way I contain costs at Hallowe’en is by reusing stuff from previous years. When the children were tiny, I lovingly made a couple of trick or treat bags from felt. After all that effort, I made damn sure to pack them away where they could be resurrected in future. So – resisting any calls for bright orange plastic pumpkin baskets – the home-made trick or treat bags were brought out for another year. We also dug out previous supermarket costumes, so my daughter could dress up as the grim reaper, and my son could transform into a skeleton. The fluttering cut out bats, crepe paper ghost, haunting blue lightbulb and cardboard grave stone all made a reappearance too. I was amazed to discover we’d run out of IKEA tealights (thought that bag was inexhaustible). 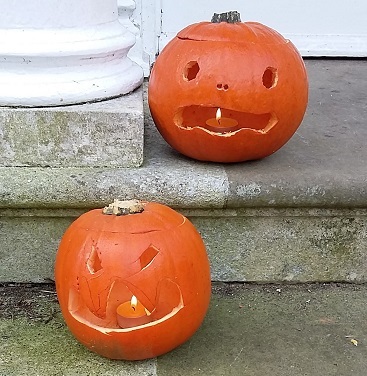 Luckily we had some elderly Citronella tea lights that worked fine inside pumpkin lanterns, even if they weren’t much needed as insect deterrents at this time of year! Total cost for costumes and decorations: 0p. General feeling of smugness: priceless. When I do spend money at Hallowe’en, I look out for offers and discounts. One year, I made the mistake of buying pumpkins ages in advance of Hallowe’en. By the time it got to 31 October, we ended up with two rather mouldy gourds oozing onto the doorstep. So this year, I waited till a couple of days before, and we picked up two medium-sized pumpkins for £1 from Morrisons. Bargain. I also spent £1.50 on a big bag of jelly snakes on offer, for any children showing up at our front door. Back at home I persuaded the children away from the TV long enough to draw their own designs and have a go at pumpkin carving. 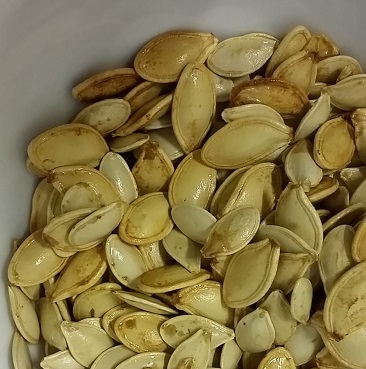 Luckily they emerged with all fingers intact, although I never realised the contents of two pumpkins could cover quite so much of the kitchen. Rather than just binning the pumpkin contents, I laboriously sorted through the pumpkin seeds, rinsed them, and roasted them with a glug of olive oil for 10 minutes. They made a surprisingly tasty, crunchy snack. I’m not convinced pumpkin flesh tastes of much, but I’ve put it in the fridge ready to make pumpkin, bacon and red lentil soup. As a general rule in life, I reckon most things taste better with bacon. 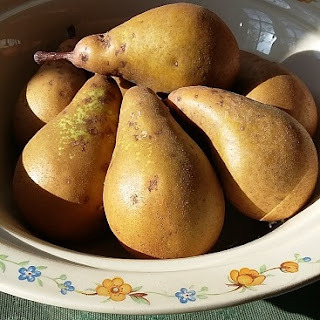 This week I also picked up some windfall pears from underneath the tiny pear tree in the secret garden. They’re not very ripe, but I’m hoping if I poach them they’ll taste nice in a crumble or eaten with ice cream. It is still very exciting to have any produce grown in our garden, after all the years in London with no garden at all, or just some tiny beds round paving. 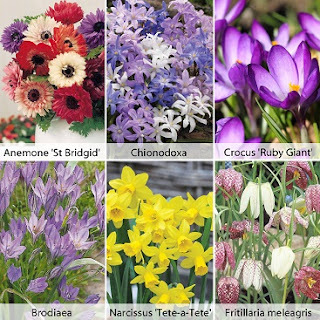 In a fit of gardening enthusiam, I ordered some bulbs spotted on an email of offers from BBC Gardners’ World magazine. Bulbs are my kind of plant, because you just bung them in the ground and forget about them – no thinning out, watering, pruning or anything requiring further effort. It was one of those tricksy “free” offers, where you actually have to fork out for postage and packing. However, I reckon £5.65 for 200 spring bulbs from Thompson & Morgan*, a company based locally in Ipswich, is a good deal. The offer included beautiful snakes’ head fritillaries, mini daffodils and crocuses. I don’t even know what brodiaea and chinodoxa are, but they look pretty. Anyway the grand plan is to plant some in our rather forlorn big ceramic pots, so we have extra colour outside in the spring. I also have vague thoughts of popping some in smaller pots as potential Christmas presents. 2017 update: I think this particular offer may have expired, but Thompson & Morgan* do have some other good deals available, such as four packs of summer flowering bulbs for the price of three*. October may be over, but my savings challenge continues, in that I still plan to write up the small changes I made to spend less, earn more and save a chunk of cash towards Christmas. I definitely saved more than £100, and will be working out quite how much more! 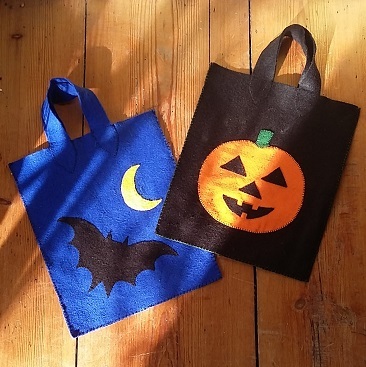 Now over to you – any top tips for a thrifty Hallowe’en? I’d love to some inspiration for next year! Indicates affiliate links, so anything you buy through them will help support the blog, as I will get a small commission, at no cost to you. Many thanks! I was astounded this year to see Tesco selling huge crates of pumpkins in the doorways for £1.50 each and then on the normal vegetable display selling smaller 'edible' pumpkins for £3.50. Am I mad or is there a difference other than size. The world has gone barking mad!! Your October savings challenge month was a really good read.